Despite its cold waters and harsh winds, the North Sea is a fertile basin for phytoplankton blooms. The drifting, plantlike organisms tend to be most abundant in late spring and early summer due to high levels of nutrients in the water and increasing sunlight. 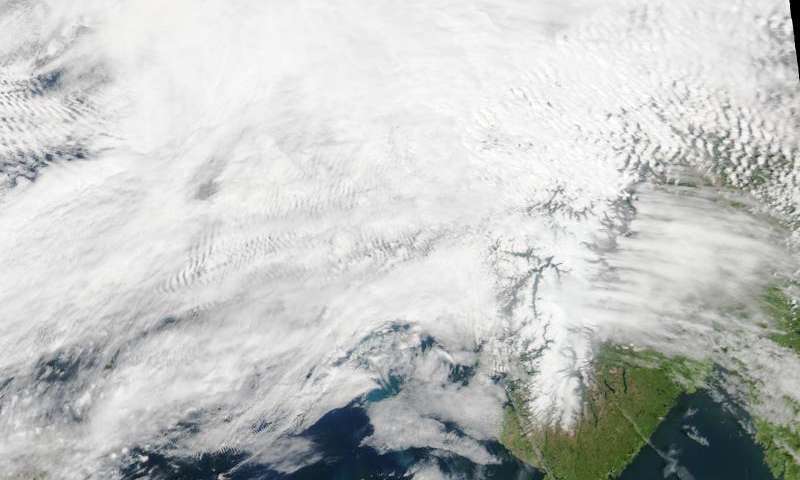 The intense winds blowing over the relatively shallow North Sea causes a lot of vertical and horizontal mixing that brings nutrients to the surface, as does runoff from European rivers. This image, acquired on June 11, 2015, by the Moderate Resolution Imaging Spectroradiometer (MODIS) on NASA's Aqua satellite, shows a mass of phytoplankton blooming between Denmark, the United Kingdom, and Germany. As compared to a June 6 image showing a different stage of the bloom cycle, areas of concentrated phytoplankton are smaller and most have the milky color characteristic of coccolithophores; there are few to no green areas. The change could be due to the short life span of phytoplankton—two to six days—and differences between the species. Some outlast others because of their ability to survive at lower nutrient levels. Some researchers have found that numbers of plankton can actually begin to increase in the middle of winter, when growth conditions would seem to be at their worst. Studies suggest that winter storms churn the ocean and cause deep water mixing. This water mixing allows for phytoplankton to grow and live at depth without being spotted by their predators. When spring arrives, phytoplankton can fully bloom because not only are the nutrients available, but there is a longer period of sunlight.